Pleasant Home Premium Beef and Pork is a story that begins with two families because of education, friendship, faith, and agriculture. In 1999, the Knobloch family moved from Iowa to Ohio. They met the Stoller family through Ohio State University when Neil was an instructor and Tony Stoller was a student in Agricultural Education. Tony was in a couple of classes that Neil taught while he was getting his degree. The Stollers started raising beef cattle in 1994 when Tony was a high school student in FFA. He started selling premium beef to local customers in 1998, and the demand grew steadily as customers enjoy the high quality meat. The foundation herd was established with 3 Limousin heifers known for marbling, tenderness, and feed conversion. In 2007, Neil and June purchased a bred Duroc gilt for their boys, Grant & Nelson (ages 11 & 9, at the time). 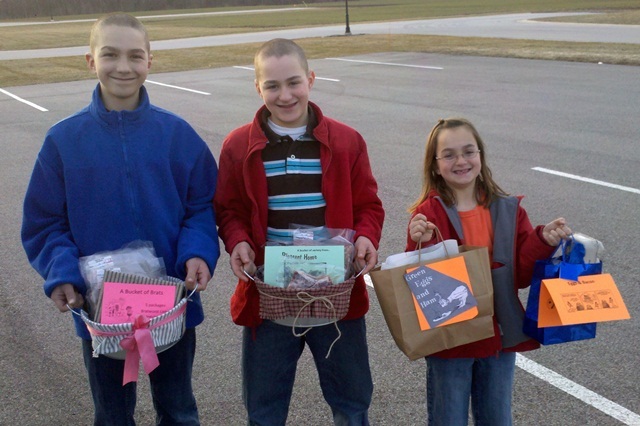 The boys wanted to raise pigs for premium pork and to show in 4-H. The Stollers asked the Knoblochs if they would be interested in joining forces to sell premium pork with their premium beef enterprise because several customers were asking for pork. The new business started when the Knobloch boys raised a litter of 10 purebred Duroc pigs and sold all of the pigs directly to their first customers in 2008. The boys bought their first Berkshire sow one year later in December, 2008. 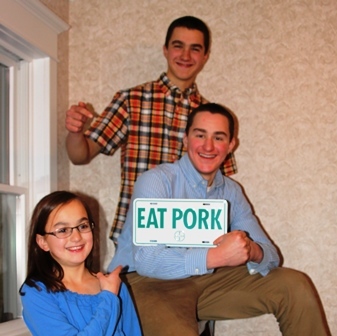 They now raise Berkshires as their premium pork. In 2010, Kedron received her project–25 laying hens. Although she enjoyed selling the eggs, she spent more time with the pigs. Her dad bought her first Berkshire gilt at the Iowa State Fair. Her first litter was 8 pigs. She enjoyed seeing two of these pigs become Reserve Champion Berkshire Barrow at the 2011 White County Fair, and Reserve Champion Berkshire Boar at the 2011 Iowa State Fair. She is now a partner in the business with the boys, and started showing pigs in 4-H in 2012. In 2013, Fly’n K Berks entered a pen of 8 Berkshire market pigs sired by our herd boar, Walter, into the Progeny Testing Program. Walter received a PORQUE Sire Award for being 4th overall Berkshire on meat quality traits. Walter sires pigs that have excellent tenderness and juiciness meat qualities. Many customers have shared positive comments over the years that support these results.